Every month, FamilySearch puts together a blog that shows the new changes and updates that happened on the FamilySearch.org website and on their apps. They often add new things to their vast resources and improve features that already existed. Here is a look at what’s new at FamilySearch as of December 2016. In December of 2016, FamilySearch made some changes to Family Tree. They also made several small improvements to the Family Tree mobile apps. The changes involve both the Android Tree app and the Android Memories app. Changes have also been made to the iOS Tree app. The View My Relationships link will be updated to calculate the relationship between you and a specific person in your family tree. FamilySearch has expanded the search parameter. 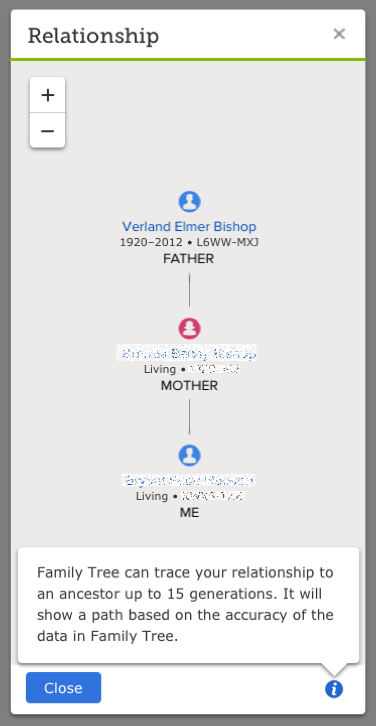 Previously, the View My Relationship link could show you how you were related to a person up to four generations up from you and 1 generation down. The new change enables the View My Relationships link to show you how you are related to another person up to 15 generations away from you (in both directions). You might be related to someone in more than one way. The View My Relationship link will now show you the relationship that is calculated first. 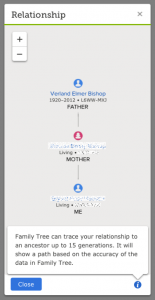 The FamilyTree Android app has had some noteworthy changes made to it. You can now check for possible duplicates for a person. You can now tag persons in photos. In addition, you can also tag a region in the photo (such as behind the faces of multiple people) and then attach that photo to persons in FamilySearch. The Memories Android app will now also let you tag person’s in photos. Just like with the FamilyTree Android app, the Memories Android app will now let you tag a region in the photo and attach that photo to persons in FamilySearch. The FamilyTree iOS app, and the Memories iOS app, already gave users the ability to tag persons in photos. It also had given users the ability to tag a region in a photo and attach that photo to persons in FamilySearch. The new changes to the Android versions of those apps catches them up to what the iOS versions already could do. In November, the Family Tree iOS app had a major update that let users navigate between features using navigation tabs at the bottom of the app. This allowed users to have 4 tabs or windows open at a time. Each tab can navigate forward or back to previous views (in the way a web browser can). This feature is being developed for the Android Tree app and will be released in the future.